﻿﻿﻿﻿﻿A raccoon-striped tail and cat-sized body help identify the elusive, nocturnal ringtail. As I saunter down a rocky hiking trail at San Marcos’ Purgatory Creek Natural Area, a swish of what looks like the long, bushy tail of a Madagascan ring-tailed lemur catches my eye from a bed of sand-colored rocks some 200 feet away, stopping me right in my tracks. “What is that?” I gasp, entirely convinced I have just discovered a lemur on the loose. As the black-and-white tail continues to flick, I search for what should be the rest of the lemur’s gray body and signature yellow-orange eyes. But the suspected escapee suddenly lifts up its head and meets my bewildered gaze with gigantic but dark, round eyes. I notice its large, upright ears and tan, narrow body and realize this wickedly cute creature is not what I thought it was. One thing I am sure of, though: I know I’ve never seen it before. Most Texans haven’t, as it turns out. The few who have seen it may have also mistaken this critter for a lemur on the run, just as I did, or a funky-looking raccoon. Commonly known as a ringtail cat (Bassariscus astutus), this slender, cat-sized carnivore is surprisingly not a cat at all, but actually closely related to raccoons and coatis. 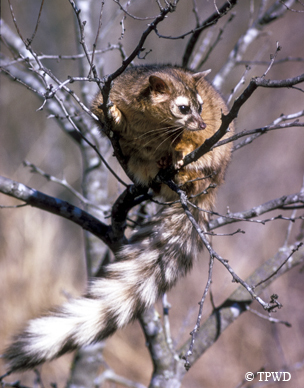 The name “ringtail” comes from the seven or eight black rings on its tail. The animals are also referred to as miner’s cats (historically valued for hunting mice in mines), civet cats (because their musky secretion resembles the smell produced by African civet cats) and cacomistles (derived from an Aztec Nahuatl term that means “half mountain lion”). Weighing in at three or so pounds, with an acute sense of hearing and exceptional night vision, this Texas native’s commonly mistaken identity is due in large part to its predominantly nocturnal lifestyle and shy, elusive nature. Ringtails are also expert at climbing, capable of crawling into almost any cranny and crevice or clinging to a cliff, no matter how steep. They are also impressively quick at running, skilled at jumping and particularly acrobatic in trees. Despite their rare appearances, ringtails range throughout most of the state, more commonly so in their preferred rocky habitats, such as the Trans-Pecos, Edwards Plateau and Cross Timbers regions of western and Central Texas. Studies show that ringtails play an integral role in the Trans-Pecos ecosystem by providing food for large predators (such as owls or other raptors known to capture ringtails that rise too early or go to sleep too late), affecting arthropod and small mammal populations and aiding in seed dispersal by eating an omnivorous diet. “My” ringtail finished up its foraging and slipped away seamlessly into a dark, tucked-away den. As an Arizona newspaper once put it, sporting “Bette Davis eyes, Yoda ears and Greta Garbo’s aloofness,” ringtails exude features reminiscent of all sorts of creatures but manifest them into something that is entirely unique and rarely sighted. Wild Thing: A "Tail" of Two Foxes!